At its peak the force had around 8,500 officers with a further 4,500 who were members of the RUC Reserve. An interim report was published on 28 March 1922, the first official report of the new Parliament of Northern Ireland, and it was subsequently accepted by the Northern Ireland Government. On 29 April 1922, King George V granted to the force the name Royal Ulster Constabulary (RUC). In May, the Parliament of Northern Ireland passed the 1922 Constabulary Act and the RUC officially came into existence on 1 June. The headquarters of the force was established at Atlantic Buildings, Waring Street, in Belfast, and became the first Inspector General. The uniform remained essentially the same as that of the RIC - a dark green, as opposed to the dark blue worn by the other British police forces and the Garda Síochána. A new badge of the Red Hand of Ulster on a St George's cross surrounded by a chain was designed but proved unpopular and was never uniformly adopted. Eventually the Harp & Crown insignia of the Order of St Patrick as worn by the RIC was readopted. From the beginning it had a dual role, unique among British police forces, of providing a normal law enforcement police service while protecting Northern Ireland from the activities of proscribed groups. For personal protection its members were armed as the RIC had been. The RUC was limited by statute to a 3,000-strong force. Initially, a third of positions within the force were reserved for Roman Catholics - a reflection of the proportions of the population of Northern Ireland at that time. The first two thousand places were filled quickly. Due to a slow recruitment rate from Catholics, the force resorted to normal recruitment in order to fill the remaining vacancies. As a result, representation of Catholics in the RUC never exceeded 20% and, by the 1960s, it had a Catholic representation of 12%. 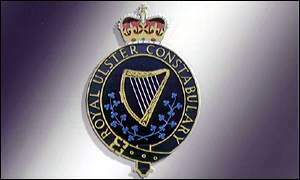 The RUC were supported by the Ulster Special Constabulary, a volunteer body of part-time auxiliary police established before the Northern Ireland Government was set up, who had been given uniforms and training. The RUC's senior officer, the Inspector General, was appointed by the Governor of Northern Ireland and was responsible to the Minister of Home Affairs in the Northern Ireland Government for the maintenance of law and order. "For twelve months after that, the city was in a state of turmoil. The IRA (Irish Republican Army) was responsible for an enormous number of murders, bombings, shootings and incendiary fires. The work of the police against them was, however, greatly hampered by the fact that the rough element on the Protestant side entered thoroughly into the disturbances, met murder with murder and adopted in many respects the tactics of the rebel gunmen. In the endeavour to cope simultaneously with the warring factions the police efforts were practically nullified. They were quite unable to rely on the restraint of one party while they dealt with the other". By the mid-twenties the situation had calmed down. Northern Ireland enjoyed a peace, interrupted only occasionally, for the next forty-five years. The murder rate was lower than in the rest of the UK and the crime detection rate was higher. The 1920s and 1930s were years of economic austerity. Many of Northern Ireland's traditional industries, notably linen and shipbuilding, were in recession. This contributed to the already high level of unemployment. Serious rioting broke out in 1932 in Belfast in protest at the inadequate nature of Poor Law relief and the threat of rioting was ever present. 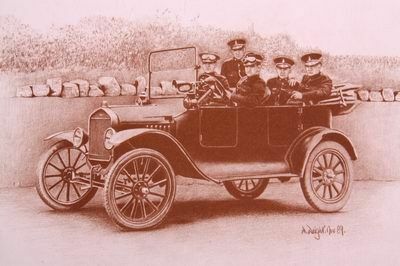 In response to the growth of motorised transport the RUC Traffic Branch was formed on 1 January 1930. In 1936 the police depot at Enniskillen was formally opened and an £800,000 scheme to create a network of 196 police barracks throughout Northern Ireland by rationalizing or repairing the 224 premises inherited from the RIC was under way. In May 1937 a new white glass lamp with the RUC crest went up for the first time to replace the RIC crest still on many stations. About the same time the Criminal Investigation Department (CID) in Belfast was significantly expanded, with a detective head constable being appointed to head the CID force in each of the five Belfast police districts. Sporadic IRA activity in the 1930s also required that the RUC be vigilant. In 1937, on the occasion of the visit of the King and Queen to the province, the IRA blew up a number of customs posts. In 1939. an IRA bombing campaign was launched in England. This campaign effectively ended on the 25 August, a few days before the outbreak of the Second World War. The war brought additional responsibilities for the police. The security of the land border with neutral Ireland was one important consideration. Allied to this was a greatly increased incidence of smuggling due to rationing, to the point where police virtually became revenue officers. There were also many wartime regulations to be enforced, including 'black-out' requirements on house and vehicle lights, the protection of post office and bank monies, and restrictions on the movement of vehicles and use of petrol. The RUC was a 'reserved occupation', i.e. the police force was deemed essential to the war effort on the Home Front and its members were forbidden to leave to join the other services. The wartime situation gave a new urgency to the discussions regarding the appointment of women police. The Ministry of Home Affairs finally gave approval to the enrolment of women as members of the RUC on 16 April 1943. with the first six recruits starting on 15 November. Post-war policies brought about the gradual improvement in the lot of the RUC, interrupted only by a return to hostilities by the IRA. The IRA's 'border campaign' of 1957-1962 killed seven RUC officers. The force was streamlined in the 1960s, a new headquarters was opened at Knock in Belfast and a number of rural barracks were closed. In 1967, the forty-two hour working week was introduced. Dedication of The RUC Book of Remembrance. 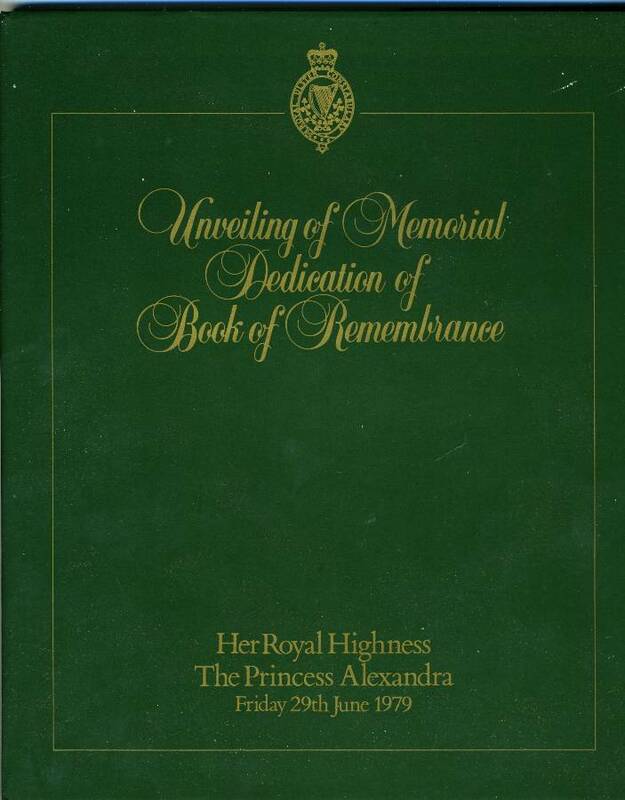 This volume contains a Roll of Honour' of Police personel killed in the line of duty, from Special Constable Robert W. Comston in 1921 to Reserve Constable David Stanley Wray in 1979. By then (1979) Some Two - Hundred names are Recorded.. 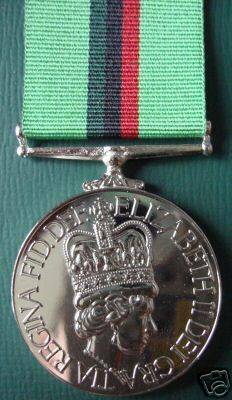 The Royal Ulster Constabulary GC, usually known as the RUC served the people of Northern Ireland for almost eighty years. The force was directly targeted by Irish Republicans during the troubles & as with all police forces was directly in the line of fire both litterally & politically. to view the force's Roll.of Honour from Sept 1924 up to May 1994. The Border Campaign was an ambitious plan to use the tactics of Flying Columns in the Irish War of Independence. This account of the campaign, immortalized in Dominic Behan's ballad The Patriot Game, outlines the origins, planning, and phases of the conflict, and how it was wrapped in outdated notions of republican romanticism. The campaign was to wage a guerrilla war, make Northern Ireland ungovernable and force a British withdrawal. It was an abject failure. The IRA received little support from Northern nationalists, while governments north and south introduced internment. Note: This cover photo shows a fine period image of an armed RUC constable. Also in the picture is a police poster offering a reward of £5000 for information leading to the conviction of the IRA killers of Sergeant Arthur James Ovens RUC., killed at Coalisland Co Tyrone in 1957.